Our Transportation Service is easy to use and affordable. 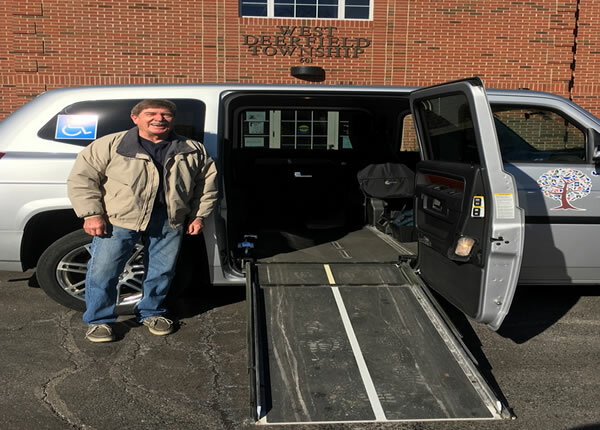 GOING PLACES is our appointment-based transportation service for residents of West Deerfield Township. If you have mobility challenges that prevent or restrict your ability to meet healthcare needs, we have a friendly staff of drivers who know the community well and can get you to your appointment. PRE-REGISTER TO MAKE AN APPOINTMENT. Click here to download the Client Registration form, or call our Transportation Secretary at (847) 945-0614 Ext. 310 and the form can be mailed to you. Once you’re registered, you can schedule medical appointments up to 30 days in advance. And you’re eligible for up to 2 round trips each week. If there’s a special hardship, please contact the Township Supervisor, Alyson Feiger. CALL (847) 945-0614 Ext. 310 TO SCHEDULE A TRIP. The earliest you can schedule a pick up is 9am. You also need to know that your appointment must be finished by 3:30pm. Our drivers have served the community in a variety of capacities in their past, but please understand that they are not trained medical professionals. WE’LL TAKE YOU WHERE YOU NEED TO GO AND BACK. Whether your appointment is at the Lake Forest, Glenbrook or Highland Park hospital, or even the V.A. Hospital in North Chicago, if you’re eligible, we can take you. In fact, we’re able to take you to other locations for your treatments and physical therapy. NON-MEDICAL TRIPS MAY BE AVAILABLE, TOO. Medical appointment needs are our top priority. But you are able to reserve our Transportation Service for non-medical appointment needs three days in advance if our schedule allows. YOUR RESPONSIBILITY: BE PREPARED 15 MINUTES IN ADVANCE. Our Going Places Service is not an emergency ambulance or medical transport service. You are responsible for getting to and from the van at your pickup location and at your appointment location either on your own or with your own caregiver. Your caregiver may ride with you. Drivers are not allowed to enter homes to assist riders. Drivers are only allowed to wait five minutes.